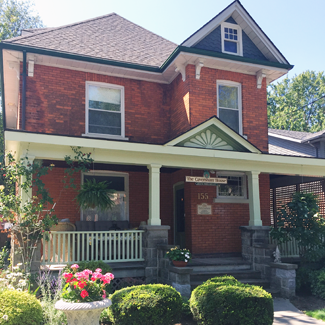 The Caversham House is a great downtown location close to all theatres. With ample off-street parking, most guests choose to park their vehicles and walk to theatres, restaurants, shopping and parks. This historic area with century homes in beautiful settings makes our neighbourhood a perfect place to stroll. Read the Architectural Society’s signs dotting the houses, recording the original owners and their professions. Find inspiration for your gardens when you take the spirit of Stratford home with you. For guests travelling by train, bus or air, your hosts would be pleased to provide you with transportation advice and help with reservations for your local transport. With many bike paths nearby, The Caversham House offers secure storage for bicycles and motorcycles. To make an inquiry or reservation, please e-mail us.